The Shaman’s relationship with wild animals in nature is legendry. However, not much is known about the relationship between a Shaman and his/her Animal Friend- Guardian Angel at home. Our family has had many animal friend guides over the past thirty odd years. All of them were Masters and taught us invaluable lessons of unconditionallove, patience hope and loyalty. These lessons from our animal friends were more profound than what we could have received from fellow human beings. Some of our animal friends stayed in body for a very short time and some for many years. The Earth time we spent with them depended entirely on the ages and professions of family members. Our young children spent more time with them since both my husband and I were working. Later my son joined the Indian Army and my daughter was studying Montessori. Years passed and both my husband and I were a few years away from retirement. My son a young army officer was deployed on active army duty in the jungles of Manipur, India, battling insurgency &terrorism. We were looking forward to his wedding in December and there was great excitement in the air.Unknown to us a great tragedy was unfolding itself. As fate would have it, one day we got a call saying our son had been martyred in the early hours of 3rd Nov 2006. Capt. Sameer Roy Choudhury had transcended the frontiers of time and space. To say that our world was shattering into a million pieceswas an understatement. We went through the motions of living. Trying to gather ourselves,to pick up the shardsof glass our souls had fragmented into.To try and make a living picture of all thefragmented, lost pieces of our souls.Day by day and moment by moment we went from active grieving to a place of quietness. The very life energy seemed to have got sucked out from the family soul. Anuneasy silencehung around, like mist, broken by huge bouts of crying from one of us. Months slipped by as we returned to our jobs and lives in robotic monotony. Nightimes came with traumatic nightmares and waking at unearthly hours. We could see our son everywhere. His huge memory clung to every picture frame, book, music, our entire home. Hisfavorite perfume wafted out of his closet and ceremonial uniform. We desperately clung to these fragments of his physical presence, trying to make sense of our lives. My Shamanic path and meditation helped me to journey into the deep recesses of the underworld for healing and insights. As I wandered in the ‘cave of wounds’ I understood the Past life stories of my individual and family wounding. Karmic connections became clearer. One of my closest power animals – a pure black wolf wouldappear on these journeys. Often, holding my hand in his mouth as he led me into other ‘caves of consciousness’. I asked him what was it that hewas trying to convey to me? His answer came a few weeks later in the form of a puppy,which looked like a plump baby wolf. 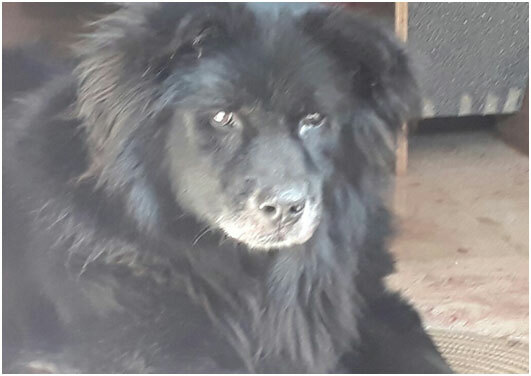 One day we received a call from my son’s commanding officer, asking us if we would like to adopt Sameer’s four month oldpet, a Tibetan mastiff.We did not know how to respond. A tiny being was waiting to come to his master’s home. Were we as a family, ready to receive him with warmth and love? We seriously doubted our capabilities to take on such a precious responsibility in our broken state. However, our great need to connect with our son’s pet overrode all logistic and psychological obstacles. So, one Sunday morning a little bundle of soft fluffy black velvet arrived at our doorstep. All of fourmonths, a bright eyed Tibetan Mastiff puppy.He had journeyed for four days and three nights from the jungles of Manipur to reach us. His bright, wise eyes looked straight into our souls and the connection for a life time was made. Our daughter Shurobi, namedhim Bumble. Hereminded us ofa big fat black bumble bee buzzing around the garden.Like any other puppy he was full of mischief and naughtiness. He opened up his huge heart and adopted us right into it. His arrival was like the first Monsoon rain! Lifting our spirits and renewing the life force within us. We were shaken from our grief induced lethargy into the realm of joyful movement. Bumble brought back our smiles and a reason to look forward to another day! From day one he appointed himself as our care taker. He fiercely protected his home and family. Not a soul could walk into our home uninvited. No amount of training could tame his wild nature. If he suspected a person of malicious intent he could bark, bite& even tear any one apart. We had to be extremely careful of keeping him secure when visitors and unknown persons came home. We were living in a remote place where robberies often took place. However thanks to Bumble no one ever dared to enter our home uninvited! He grew in leaps and bound, literally! He was a beautiful synthesis of a wolf, bear and lion. Rightly so, as they were all energetic parts of my animal guide constellation! He was our dear, constant and loyal companion for 12 years. Somewhere along his journey he was joined by his soul mate Coco. They had wonderful times together exploring, guarding, hunting and lazing around. They loved going on long walks with my husband. They birthed six beautiful pups, their only litter. Coco passed into the soul realms at a fairly young age. Bumble missed her and was lonely for a long time. Thereafter he became more closely attached to me and was my constant shadow, companion and soul guide. Hewasvery choosy about who hugged him, and not fine with too much cuddling. However, he loved myhugs &was very generous in giving me his wet lick and kiss. He loved to be kissed on his third eye chakra. At night he lay across my bedroom door, loving and guarding me with all he had. He would instinctively know wheneversomeone in the family was unwell. He would spend all his time watching over the sick person. Many a times, not even eating or going out, till the person waswell. He had a unique way of loving and being with everyone in the family.He loved biryani, paneer and Good Day biscuits, and would make sure he had an equal part of his favorite food. He had many admirers and people would watch him from a distance. The very brave ones would take selfies with himduring his walks, off course with permission! 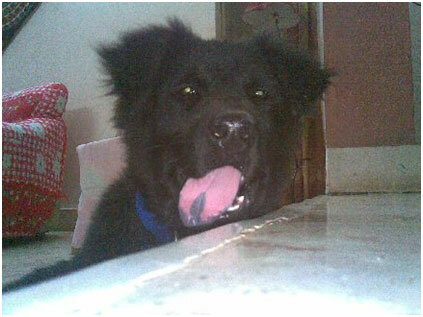 There was no other dog like Bumble in the whole of Hyderabad, indeed very few in India! His huge lion like shining mane and a thick bushy tail held erect, made him look extremely majestic. Time flew and Bumble got older. Both his eyes developed cataract. His gait became slower as his body grew less agile.Hedepended more onhis sense of smell and hearing, which were acute. He knew hewas loved beyond measure. This helped greatly; as he tackled various challenges of old age. He knew he was secure in our love and care. His majestic persona remained intact and he now looked like an aging lion with a lot of white beard! 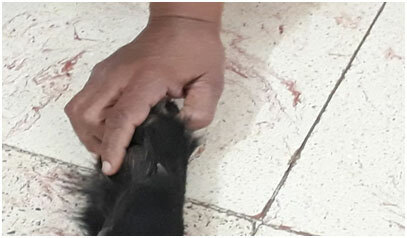 We developed a special Shamanic breath workpattern, where I connected to his breath, at his pace.This was our language for giving him food, medicine and water. It was our physical channel of communication. Synchronized breathing would alert him to take food or medicine that he had earlierrefused. I also used to connect to his breath when his breathing washeavy and labored. As soon as I entered his breathing rhythm, I would start slow conscious breathing.This would immediately allow him to breathe easily and comfortably, following my breathingrhythm.In no time his breathing would be back to normal! This is a powerful Shamanichealing energy that my dear friend Bumble gifted me. Life’s flow was reaching its ebb, as Bumble stopped eating his regular food. He would just take a few morsels and drink lots of water. Unlike humans, Animal Gods know how to treat their bodies. He realized his kidneys were not working, even before the vet made his diagnosis. He let me know that he was now no longer open to deep conscious breathing. A slow imperceptible shift was happening within him. He grew weaker in body but his wonderful spirit still upheld his proud carriage and dignity. Even with somuch trauma, he always walked outside to answer nature’s call. He never ever cried or soiled himself. A human being could not have lived with so much dignity and grace in such a painful sickness. We watched over him round the clock, He was supported by us in whichever way he could find comfort. Towards theend he was on drip twice a day. Gently allowing himself to be handled. Instinctively, he made the transition from fierce to gentle.Human beings find it difficult to transcend ego …but an Animal God is far above these boundaries. I could intuit he was very sick as he would fall trying to stand or walk.He would become disoriented at these times. I would quickly hold and help him. His heart beats would hammer into my palm as I soothed, kissed and comforted him. He would nuzzle close to me, accepting the warmth and safety I offered. He would gently lick my tears of helplessness as he tried to comfort me. We had deep and long telepathic conversations as we rested holding palm & paw. I would whisper to him to let go of his duties & responsibilities to us. That we would accept whatever he decided. I requested him to please let me know. He would look deeply into my eyes as if trying to tell me something. His valiant spirit was fighting to live. It seemed he was not ready to move on and we respected our dear friend’s unspoken wish. Our friendDr. Jacob Mathews, gentle soul and wise vet, suggestedeuthanasia. Headvised us to give it a thought, since Bumble was in great pain. This was however, too difficult to imagine. However it was a last resort option. We wanted Bumble to live;till He was sure he wished to leave. He would know….we would know. Weasked the Great Spirit for insights. To take away Bumble’s pain, to allow him to leave. One day as we lay on the floor after a painful bout of his falling, I realized what he was trying to tell me. ‘It was the Soul Contract between Bumble, my Son &I’. Finally everything made sense. Yes, my son used to take immense care of me;in facthe treated me like a queen. So did Bumble.It was a contract of loyalty and love towards me, that Bumble was living. A promise he had made to his Master thatof taking care of his mother (me). This was the reason Bumble did not give his soul permission to vacate his body. A ‘soul contract of protection and unconditional love, of companionshipand bonding’. I realized I needed to release my dear Friend from this soul contract, so that he could proceed on his journey. That day I told him “Bumble,it is ok to let go dear friend…dear child…you have taken so much care of Mamma all these years. He heard me from deep within his soul. He slept that night. The next day he was very unwell and scarcely able to move. He remained like this the whole day, not having food and a few sips of water. Medicine & healing were no longer being accepted by his soul. I respected his silent request to just be with him. That night Bumble stumbled and fell twice.Both times I held him so that he might not get hurt. Something seemed different as I last settled him down. I covered him with the soft quilt, as I stroked and kissed his forehead. I once again told him “it is ok to let go Bumble, Mamma will manage”. Hisheartwas pounding veryfast, his breathing heavy and labored. I gently soothed his heart chakra till his breathing got slower. As tears ran down my face Bumble looked deep into my eyes. He seemed to understand and closed his eyes. Soon he was in deep sleep, breathing gently. ‘I dreamt that Bumble had passed on’. When I got up and checked on him…he was still sleeping very deeply but his breathing had become very silent. I knew with my deepest soul wisdom that Bumble had told me what I needed to know. His decision was made and his soul was in transition. The day dawned and he was still journeying. Later after a while as I touched him he seemed to have left. As I stroked and checked his mouth it was cold and teeth clamped together. ‘Warrior Animal Companion of a Warrior Master.Dignified and Majestic in death as he was in life’. Bumble I miss your physical presence dear friend, even as I see a black shadow near my bed at night. I know your beautiful soul came to check on his Ma. At timesin the garden, in the evening, I feel your gentle presence in your favorite place. I know you are now out of pain and playing with your Master in the soul planes. Yet your love and guardian spirit self are always with me …will be with me till the end of time. My Guide, my Guardian Angel. Love you my dear Bumble Bhalu. Deep gratitude for your huge love in our lives. A kiss on your beautiful forehead and a lick on my face from you!